Little Squirts - reusable water bottle for kids. Great for kids on the go. Safe to be washed on top rack of dishwasher. 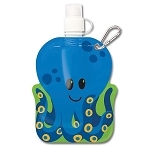 Little squirt has a clip to hang on backpack and extra protective lid. Little squirts come in fun shapes and designs, for boys and girls.